When students are sailing into University taking courses they’re not sure about quite yet, it’s a little daunting to say the least. They are expected to know what they want to do for the rest of their lives and then work in that field happily ever after. Wheww!!! If that’s not enough stress and pressure then I don’t know what is. I was in this boat before and it was really hard trying to figure out what I wanted to do for the rest of my life. I completed my first year at University taking random courses with no direction. Kind of like a fly in a sand storm. At the end of that year I realized I didn’t want to waste any more time or money on something I knew nothing about so I took two years off and worked full time so I could think about it. Later I went back to school became a nurse and the rest is history. To all my University friends and young career hunters and warriors, I feel for you. However…if you can take a step back and dig really deep to know who you truly are and find out what you’re made of, you will be more prepared to take the right path for you. Two big reasons people go into the wrong field is because their parents told them to or because of the money it will bring after they graduate. These might be good reasons short term but eventually you will get bored, guaranteed. Let me ask you this; would you rather be happy or successful? Most people say successful. Does success bring happiness? Especially if you are working in an area where you make good money but you don’t enjoy what you do? How many years can you work and live like that? You might work so hard at being that amazing surgeon but if it conflicts with your values, you are like the fish trying to climb a tree. Fish do much better in the water therefore maybe you need to change your environment. Do what you were born to do, what you are good at doing, what comes naturally and puts a smile on your face. It’s not that you aren’t good enough you just need to find your tribe. When you are happy, success follows you. There was a study conducted at Harvard University a few years ago called the Happiness Project. 5000 graduates from Harvard University set out to conquer the world with their new degrees in hand. All were extremely intelligent and became successful in their careers. A year after their graduation the question of happiness was asked; “Are you happy now that you are successful?” Do you know what the percentage of those 5000 students were happy? A sad 3%. That’s it. Why? They chose paths based on statistics, not their values. They were good at what they did but it somehow clashed with who they were as a person. If you are a social person both personally and professionally, then sitting behind a desk all day gets pretty boring no matter how much you make. By choosing a profession that is social it fits who you are and chances of staying in it long term are higher. In career coaching there is an awesome tool that helps fill the gap of what’s missing. It’s called the Success Strategy. Ultimately when you’re doing what you love, aren’t you happy? Isn’t that success right there? Every day you need to focus on four key areas in your life in order to have a balance of success and happiness. It doesn’t have to be a long exercise but each day needs to have these four ingredients. The first is Legacy. What are your long term results or plans? What do you want to be known for? What are you leaving behind for others? The second is Creativity. Let it blossom every day. Being creative is found in anything and everything. Many of us are bloggers here and this is one creative way of many. Let your inner child out. The third is Results and Achievement. This can include professional, family and personal areas. Get something done in one of these areas every day to feel productive. The fourth is Shining Moments. It’s the time where you stop and smell the roses, pause for a moment, enjoy and share them. Where are you on the scale of 1 to 10? Which areas need improvements? What are you missing? Why is that? You might be a successful person bringing in results and achievements every day, have several shining moments and creating a legacy for yourself, but something is missing; your creativity. Sadly creativity takes a back seat when we are busy planning our lives. Maybe you used to play the electric guitar back in the day and one weekend you decide to pick it up and start playing again. There’s that creativity vibe back, you feel fulfilled because you were able to find it elsewhere and still maintain your work and other areas of happiness and success. Now all four areas are complete and so are you. Yeah!! Go out and find your passion based on who you are. Don’t let someone else tell you because even though their intentions are good, they’re not you. If you’re a fish, swim. If you’re a bird, fly. And so on. Not only that, practice the four key areas of success and happiness each day to find even more fulfillment. I wish you all the best in your endeavors whether that’s in University or out in the working world. And remember….Everyone is a genius. I love this song and this video and just felt like sharing it with all of you. The beautiful Canadian Tenors perform the legendary Leonard Cohen version of Hallelujah on the Oprah Show. Another beautiful Canadian surprise, Celine Dion pops up during their performance and makes their dreams come true, it’s so cute you have to see it! This song makes your heart want to cry and smile all at the same time because it’s about the hardships of love. The movie Shrek used this song when Ogre experienced what it was like to feel brokenhearted over his Princess Fiona and both parents and kids around the world witnessed these emotions. I thought about this song during different times of my life and I’ve used it when something new begins because it brings joy and you can’t help but say Hallelujah! On the other hand, when something ends and its been a long road, the stress of having it over also makes you want to say Hallelujah! Therefore all Hallelujah’s have equal value and for me, this song represents peace, either way. Ah…Regret! They say that in the end we only regret the chances we didn’t take. Personally I believe this to be true but that doesn’t mean we won’t come face to face with regret on things we do choose. In Palliative Care, the one thing patients talk about the most are regrets related to love. 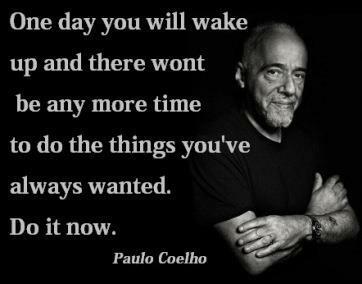 Just like our friend Paulo Coelho in the above photo says, we need to live our lives now, not later. Are you familiar with the saying hindsight is 20/20? It’s that retrospect moment, when you look back on something you can clearly see what you should have done…only thing is, it’s done. Like dating the wrong person or getting a really bad haircut. Ouch..regret. If you’ve ever made a bad decision, regret has been your roommate. Not like Sheldon’s roommate agreement from the Big Bang Theory but more like a difficult companion that can make you both tougher and more sensitive all at the same time. You get to decide if your toughness looks like unending bitterness or if your sensitivity looks like a kindness so deep it heals every wound it touches. Do you want regret to be your arch enemy or your best friend because ultimately, it’s you who decides. Even though the past cannot be changed, the way you tell the stories about it can be. For instance, remunerating the woulda, coulda, shoulda’s will keep you stuck in the past and also in denial. Something happened, yes it was horrible but it happened. Instead, try to find the life lesson that’s hidden in there because there’s always one waiting to be found which is why we’re here to learn from it. Take a positive spin on it and see what happens. Regret is a mixture of two emotions, sadness and anger. Sometimes these emotions can be overwhelming so one thing you can do is this. Write two columns with the headings Sadness and Anger at the top. Under each heading, answer this question as many times as possible: “I am _______ about __________” This is the messy hard part but remember, the only way out of painful emotions is through them. Keep writing until you can’t write anymore. It’s time to grieve what you lost. This is essential because if you don’t, it will come back twice as hard the next time around on the next situation. The moment when you see someone gaining what you regretted losing is when you know you’ve finished grieving. Bravo my friend. Now it’s time to look ahead to the future and pave a way to making better decisions. Life will bring us to a crossroads more than once and maybe what we need to do is to lean into love and not fear. Ask yourself “What would thrill me more?” rather than “What will keep my fears at bay?” But some might say the love path is anxiety provoking and scary. This is the moment you can call on regret, not as a burden but as a motivator that reminds you not to make choices that make you feel awful in retrospect. This is the upside of regret. If you’ve done all the above steps and realized everything based on love is worth doing, then go ahead, because life is about to take you on an adventurous ride of happiness. The reason I am writing this blog is because I love his quote in the above photo and wanted to share it with you. Life is like the ocean it’s big, calm, rough at times, warm, cold and sometimes blue. Let’s face it we’ve had our fair share of waves and situations come crashing down on us whether we expected them or not. However, in those exact moments we have two choices. Run or surf. If you choose to run, the waves won’t stop they will actually follow you and maybe pull you under. You may think you’re doing the right thing but it won’t last for very long. The running goes on and on and you become more exhausted, depleted, and scared, you feel as though you can’t catch your breath. Those waves just keep on comin’. If you choose to surf, then the world is your oyster. Now you have the ability to face the waves with an amazing attitude and a new added skill. 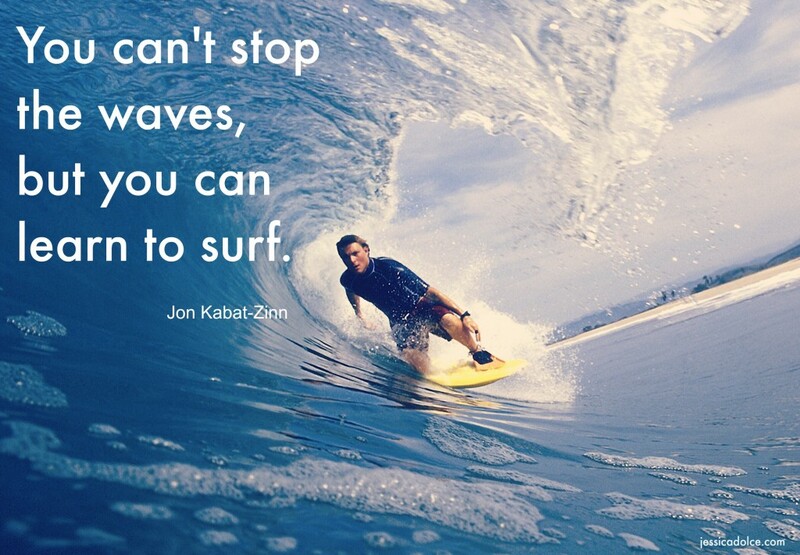 When you surf, you are living in the moment and you are in control of yourself, not the waves. You feel on top of the world and it’s easier to go with the flow than against it. You take the waves in stride and what felt scary at first is now something exciting. You understand the rhythm of the ocean and can time the big waves that may catch you off guard. Don’t be afraid just get back on your surf board and try again. You feel so brave and proud of how you are handling things and you should be! People on the shoreline are looking at you wishing they could surf like you do and you know it. This makes you smile from within and even gives you peace while riding that wave.